Jamini Roy is a very famous name in Indian History. Born in traditional and culturally rich family in Bankura, West Bengal, in the year 1887, Jamini Roy had naturally, constantly been exposed to the tradition of Bengali folk art from a very tender age. This is why his works had the unmistakable influence of the folk tradition and remained this way throughout his career as well. Strict adherence to tradition was one of the hallmarks of his entire painting career. Jamini Roy’s wealth of paintings went on to make him one of the most influential of modern Indian painters. Some of Jamini Roy’s gretest and most popular works include Santal Boy with Drum (1935), St Ann and the Blessed virgin (1945), Makara (1945), Seated woman in Sari (1947) and the Krishna and Radha series of paintings. Jamini Roy’s paintings became so famous that he soon had a vast number of admirers, including both the Bengali middle class and the elitist European clientele. His work exhibited several times over in New York and London, besides many Indian cities. He was also awarded the highest state award of India, the Padma Bhushan, in 1955. He died in 1972, in the city of Calcutta. Batik is a wax-resistive dyeing technique used on fabric. Batik is an important aspect of Indonesia and is actually considered as a national art there. Interestingly, similar patterns of the Batik art is also found in several countries such as Ghana, Cameroon, Nigeria, Mali, Philippines, Thailand, Malaysia, Sri Lanka, Iran, Bangladesh and India. 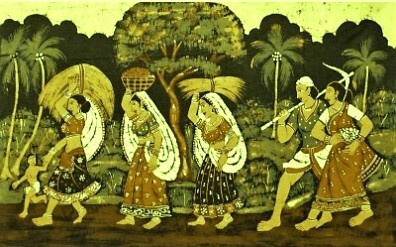 The history of Indian Batik is ancient and can be traced right back to 2000 years ago. In fact, Indians knew this resist dyeing method of printing designs on cotton fabrics much prior to any other country in the world. Indian dyes on cotton fabric were very popular even then The Indigo blue colour was one of the first dyes ever to be used. But the huge amount of trouble one had to take to make Batik was what discouraged people from studying it and entering the profession, thereby leading to a temporary decline of the art in this country. In the present, Batik was evolved, changing with the present styles and tastes. Modern Batik is simple in design, yet captivating to the beholder’s eye, since it is dynamic and constantly keeps experimenting with newer colours and patterns. Of course, this new demand for modernisaton in Batik does not, in any way, lessen the existing craze for popular traditional designs and fabrics as well. The fine cracks that appear in the wax are the characteristic effects of the batik. These allow tiny measure of the dye to sleep in. Batik wax plays a vital role in the process of Batik painting. The right usage of this wax, in the proper measure, results into an impeccable batik work. 30% beeswax and 70% paraffin wax is the measure that is generally used. During application, care should be taken to see that the wax is not overheated; else it might catch fire. The commonest Batik fabrics used to excellent Batik prints are poplin, cambric, voiles and pure silk. Natural colours derived from barks of trees, leaves, flowers and minerals were used for batik printing. Batik art in India is actively propagated and promoted mainly by the University of Shantiniketan in Calcutta and Chola Mandalam in Chennai.